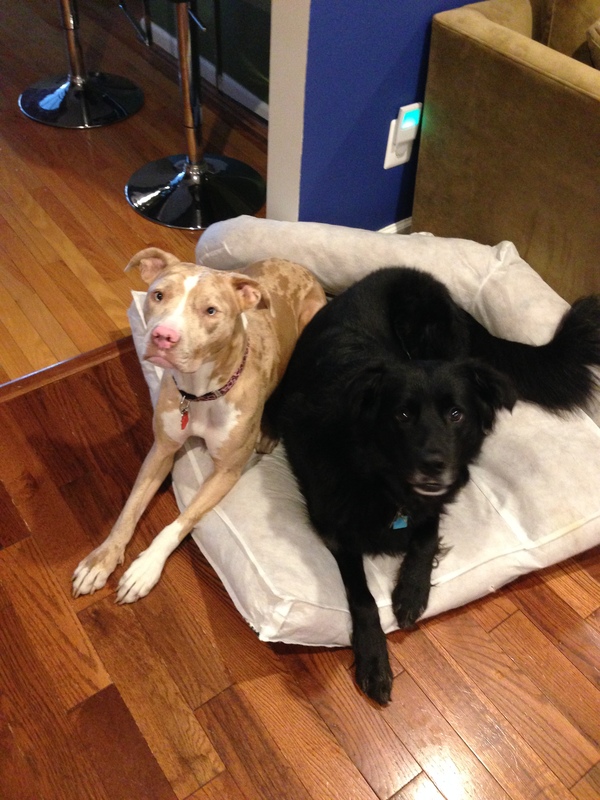 As we very publicly announced last week, MJ and Zozo are embarking on Canine Good Citizenship (CGC) certification training. We’re buckling down and recommitting to a training regimen, which is good for everyone. It’s going to be tough. We’ll be breaking bad habits, changing the direction of our previous training programs and working hard to ace the 10-part test. In my last post, I indicated it’s going to be a year-long training program. Maybe it will be longer; it all depends on the dogs. We don’t want to overwhelm them or push them too far too fast. And really, there’s only so much American Cheese I can take under my fingernails. Prong Collars to Harnesses. CGC candidates may not test on prong collars or gentle leaders. As I wrote last week, removing the prongs was a debacle. It’s like we’d never walked on leash before, and the whole world was meant for crossed leashes and blistered mommy hands. 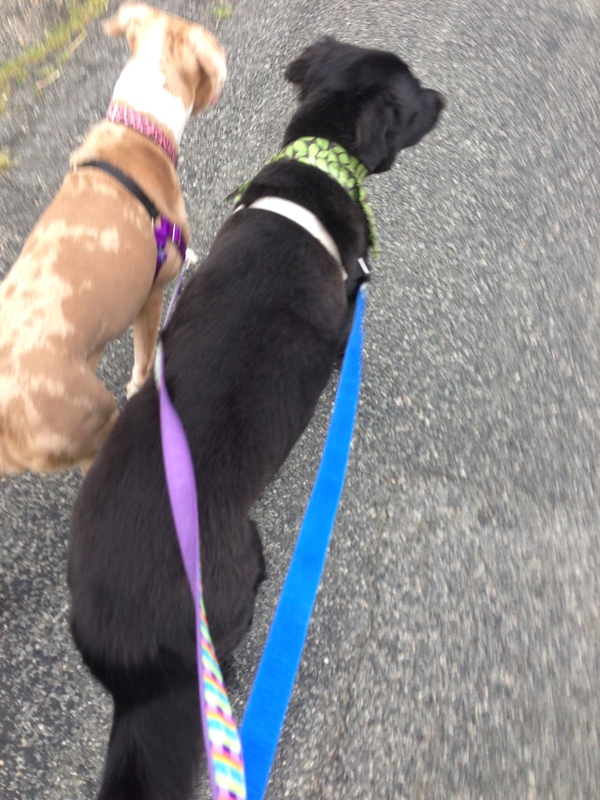 We’ve made the change to Easy Walk harnesses, and we’re back on track. It’s taking the dogs some time to get accustomed to the feel of the harness across their shoulders, and I’m still figuring out how to walk them without needing to flip the leash over their heads every 3 minutes. We’ll figure it out. Leave it. Boy, the world is full of sniffs. And it doesn’t matter if we walked by that one lamp post two minutes ago or yesterday… we have to stop and sniff and mark and sniff and sniff again. Outside, with so many senses engaged and so much newness, it’s near impossible to call “leave it” and move along like sensible folks. So instead, we’re starting from Step 1 with their meals. I bring their food to their eating spots, and they have to sit and leave the bowl until I release them (“take it”). If they lunge toward the food, I remove it. Setting the puppy table for dinner can take a few minutes now. Zo’s fairly good about this cue, except if he’s on to the scent of something interesting outside. Sit and stay. Years ago, our on-leash dogs would sit every time we came to a stop. Street corners, car doors, random slow downs in the walking speed. We’ve let them get a little lax. That’s on us. Not any more. You’re waiting for dinner- sit. You’re waiting for me to put on my shoes to take you out– sit! You’re waiting for me to open the gate because you can’t push your way through– Sit! We’re at a busy crosswalk with lots of traffic– SIT! MJ seems to be having the most difficult time with this one. I often get the “you’re slowing my roll” look of judgement from her. Fine. No cheese for you. One at a time. When MJ leaves the house by herself, she’s confident and excited at the adventures before her. When Zozo leaves the house by himself, the world is his oyster and it’s business as usual. When I take Zozo out the door and leave MJ behind, MJ freaks out. She screams, she cries, she sits in the window anxiously awaiting his return. It’s painful for us to hear her so upset, and I can’t imagine the anxiety she feels lessens as time passes. So we’ll try to divide and conquer: half the time they’ll train together, half the time apart. James will take one and I’ll take the other. Maybe we can get MJ out of the house first before she notices that Zo is going in a different direction. Separating the little girl from her big brother is the worst. Squirrels. I just can’t with this. Walking in the rain. Look, I’m not thrilled with this either, but the more they fight with me, the longer the walk takes. And then we’re all unhappy. So I guess we’ll throw a party and up-the-treat-ante to make it a special occasion. Staying at a distance/being handled by strangers. MJ will want to lick everyone and wiggle and smile and break hearts. Zozo will be cool for a while, until we disappear from his view. Then he’ll lose it. This is where our friends will come in! We’ll be enlisting folks to help handle and train as we get further into our program (and after the winter months). Laziness. Long days, stressful work, illness. We humans need to keep the commitment going. 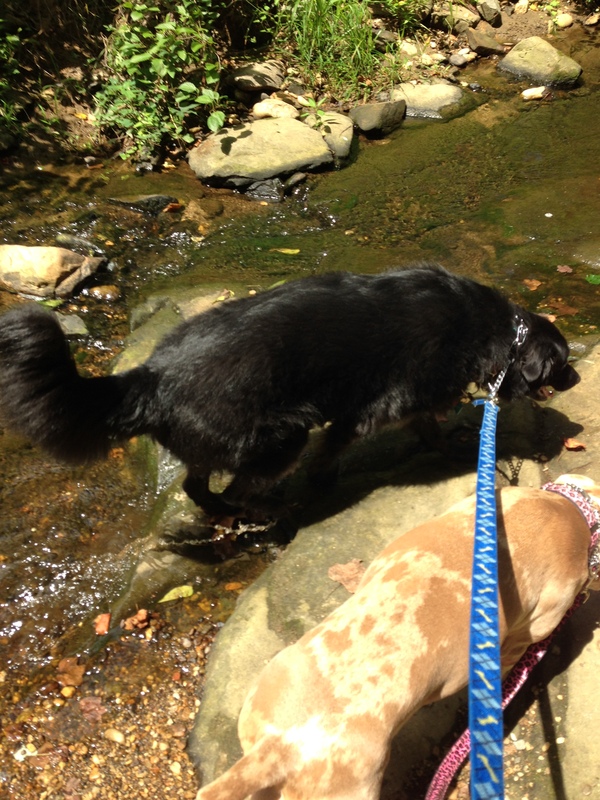 We can’t expect the dogs to take themselves for walks (that would be something). We can’t slack on correcting or praising and rewarding behavior. Really, it’s on us. There’s more. I’m sure there’s more. And we’ll find out together. This entry was posted in 2014 and tagged Canine Good Citizenship certification, Dog Training, leash walking, MJ, rescue dogs, Zozo by klgf. Bookmark the permalink. we sometimes confuse chihuahuas for squirrels, too. they are both annoying! yippie! thank you for your act of selflessness. Good luck with the leash retraining. We hope the training goes well.